West Oxfordshire District Council’s pest control service has had an extremely busy summer season dealing with a sharp rise in call outs by households and businesses to treat wasps’ nests. During July and August Sandro Silvestri, the Council’s Pest Control Officer (pictured), was responding to as many as 22 appointments a day to carry out treatments across the District. Mr Silvestri said, “Although I deal with all types of pest control problems, most of my time, lately has been spent treating wasps’ nests. People tend to first start noticing swarms or small numbers of wasps coming into the home or workplace. “Nests can get very big and I have treated some over a metre wide, holding thousands and thousands of wasps. 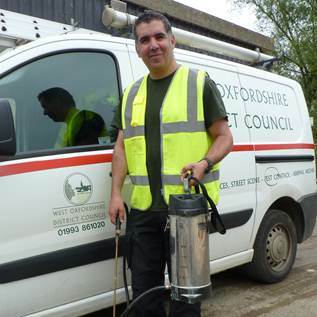 West Oxfordshire District Council offers pest control services at competitive rates and can help with a whole range of problems, from insects to rats and mice. Treating a wasps nest costs £55.47 and the service can be booked by calling 01993 861000.